Did someone give you a beautiful poinsettia plant this holiday season? If not, pick one up the day after Christmas when they go on clearance! You can enjoy poinsettias for months, even years with the proper care. They can even survive the move outdoors when the weather warms in summer! During the holidays, display your poinsettia wherever it fits with your holiday decor. After the holidays are over, remove any dead leaves and take the foil or other covering off of the pot. Place the plant near a sunny window and water thoroughly just once a week, allowing the plant to dry out a bit in between. Provide a saucer underneath the pot for drainage. Once the weather warms in summer where temps at night don’t fall below 50º or so, you can move your poinsettia outdoors with your other plants in a bright but slightly shaded location – no direct sun during the hot summer. Then when it gets too cool in the fall, bring it back indoors. You can TRY to get your poinsettia to “bloom” (turn colors) again, but it is tricky – you have to keep the poinsettia in natural light exposed to NO artificial lighting – it needs the long dark of night on a natural schedule to bloom. Whether you get your plant to re-bloom or not, it can be a delightful houseplant to enjoy. 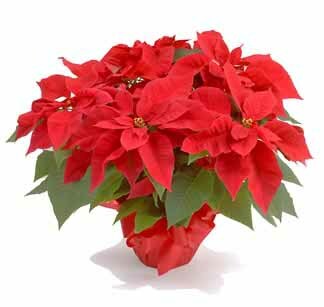 Just remember, poinsettias are poisonous to house pets like dogs, cats, etc., so make sure they have no access to them. I love poinsettias at christmas! Fun article to read. We line our front hall with them every year!